Hi, this is Dave Vernier. 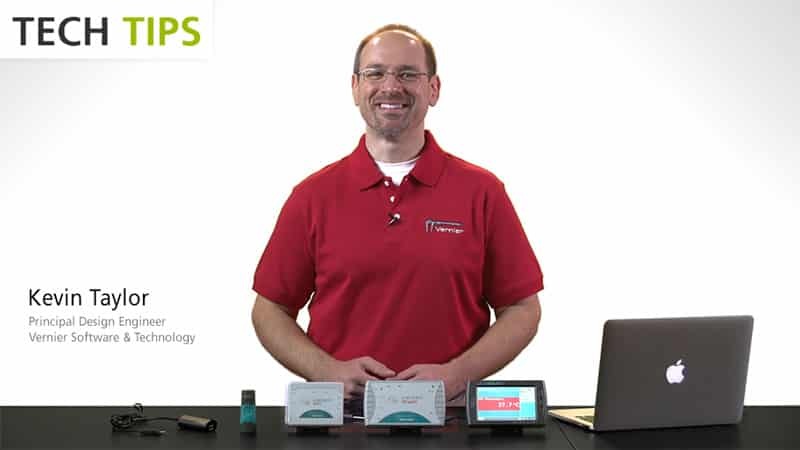 I'm here to show you the new Vernier Structures & Materials Tester. It's designed to provide a force of up to 1,000 newtons, and at the same time, measure the displacement as the force is applied. Let me show you the key parts. Up on top, we have the support mechanisms, with these crossbeams that can move around. So, we can set them to adjust the span of whatever we're testing. In here, we have a force sensor. Again, it has a range of 1,000 newtons. And down here we have a wheel, which is turned by hand. And it moves the force sensor down to apply force. But the neat thing about it is, it also includes an apparatus which measures displacement, accurate down to a tenth of a millimeter. 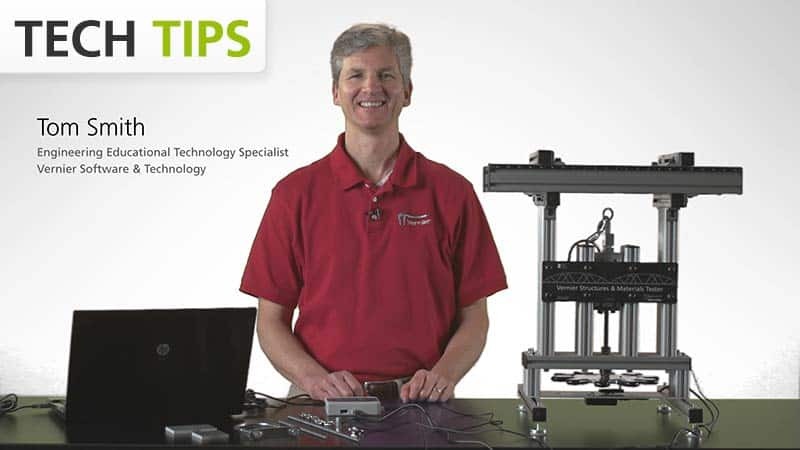 Now the two sensors that are included in the Vernier Structures & Materials Tester are just like any other Vernier sensors; BTA and BTD. They plug into any of our interfaces, including a LabQuest 2, an original LabQuest, an older LabPro, or here, we're using a LabQuest Mini. So, let me plug these guys in. We have Logger Pro running on this computer. You'll notice that the program recognized the force censor. And we have a graph of force versus time, and we have a display. And we're essentially ready to collect force versus time data. I'm interested in doing a little bit more this time, so I'm going to open a file, which I previously saved here. And it's going to add a few features to the setup. Namely, I'm going to display a graph of displacement versus time, as well as force versus time. And I've also put in a field where I can control... I set the mass of the bridge, and we'll calculate something called efficiency, which is how many times its own weight the bridge can hold. It's kind of an interesting number to compare as you look at bridges. So, basically, I've got Logger Pro set up ready to go and most things are ready. Let's talk a little bit about what you would do in a structural engineering kind of lesson like this. I think the right thing to do would be to start with some very simple things, having the students test beams like this; how strong is this beam this way versus this way, pushing down? And maybe explore things like, how strong is this truss versus this truss? And you know, things like that. I'm going to cut right to the testing of real bridges, which is kind of the exciting... might be the culmination of an exercise and a fun project for the kids. 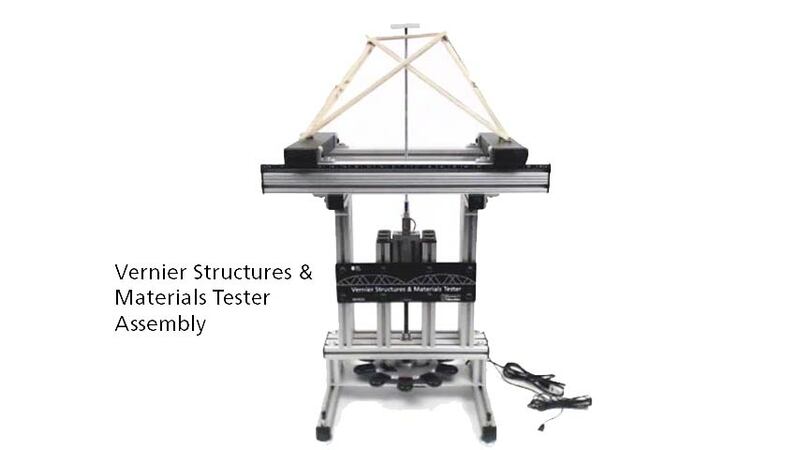 The Vernier Structures & Materials Tester comes with all this tackle here. And there are two fundamental ways to pull down on the bridges. You can either use a U-bolt, like this, with a chain coming down hooked to the force sensor, or a threaded rod. I'm going to use this method, a threaded rod screwing into the top of the force sensor, and then a metal plate on top. Better put the bridge on, though. Put the bridge here, and we'll put this plate on, and we'll be ready to test. Okay, the bridge is in place. I think I will hit the zero here to zero forces and zero displacement. We recommend using safety glasses while you test bridges, so I'm going to follow that procedure. And I think we're ready to go. I'll hit the collect button in Logger Pro, and start applying force by turning this wheel. Notice the force increasing quickly. Displacement is increasing. Force is going up a lot. Notice the auto scale, we're getting quite a bit of force here. I don't see anything giving yet. I heard a creak. More creaks. Ah, we've got failure there on the top. I think our bridge is done, so I think I'll stop this now. I have to add a historical note about this product. Forty years ago, I was a physics teacher, and I added a bridge building contest to my classes to sort of spice them up. Physics was considered pretty dry. It was a huge hit and it became so popular that it became difficult to test all the bridges. I tried every system I could think of including hanging weights, from the weight room, on chains from the bridges. I tried buckets and adding sand to the buckets. And all of them were cumbersome and slow, and it was difficult to get the job done. So, I started experimenting with jacks that I could jack and push down on top of bridges, and that worked great. It was faster. Except, how do you measure the force as it's being applied? So, I started experimenting with strain gauges and instrumentation amplifiers. And that experimentation, really, was a real key factor in the development of Vernier Software & Technology. So, it's a little ironic that 40 years later, I'm demonstrating this product, and that's the Vernier Structures & Materials Tester. 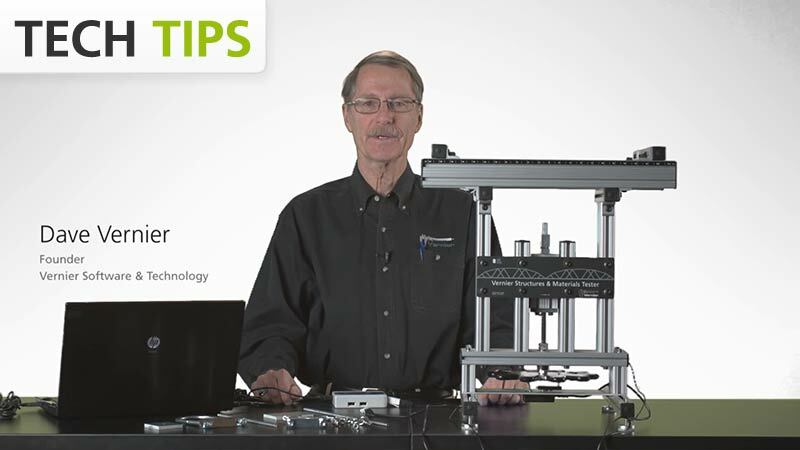 For more information, check out vernier.com.